This weekend we decided to make good use of the present spell of good weather to navigate part of the South Downs Way in West Sussex. 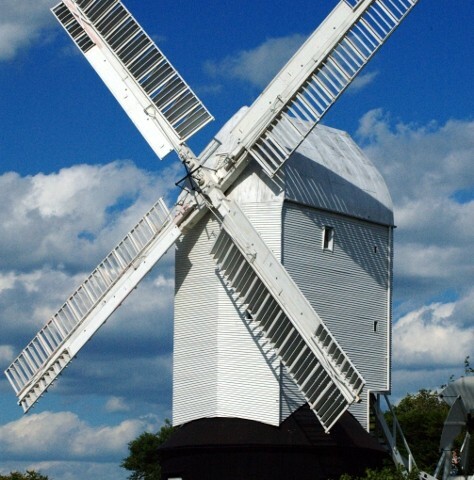 We started at the site of the twin windmills, Jack and Jill, atop a hill in Clayton overlooking much of Mid-Sussex. There was ample free parking, so we left the car and headed west along the Hassocks Link Trail to pick up the South Downs Way towards Devil’s Dyke. Jill, the white restored windmill, was open to visitors but we decided to see it another time. Heading west, we came first to a series of stables and paddocks where piebalds and bays grazed in the surrounding pastures. Beyond the stables, the trail joined the South Downs Way at a four-way junction. To the left was a bridleway, ahead the South Downs Way went towards the Ditchling Beacon, but we chose the right branch which bisected Pyecombe Golf Course. This picturesque trail, flanked by heather and wild flowers, seems to be popular with mountain bikers. Several passed us before we reached the PGC club-house at the foot of a steady descent over half a mile. Here, the South Downs Way crosses the A273 and loops right to the village of Pyecombe. We stopped in to look at the Grade I listed 12th century stone church which offered a cool respite from the heat. Both our daughters took the opportunity to read sections from the church guide from the 17th century pulpit. As their voices echoed back across the empty nave, I pondered who else might have preached from the same pulpit to the many generations of the faithful to have sat in the church over the last 800 years. One such may have been the Reverend Lewis Beaumont whose marble headstone sits in front of the altar (see picture below). Leaving the church grounds through the centrally pivoted Tapsel gate, we followed the path parallel to the graveyard as it sloped down towards the A23. For anyone duplicating this walk, the Plough Inn is nearby and would make a good place to stop for refreshments and a rest before tackling the ascent on the west side of the A23. We continued over the A23 and, after passing a farm entrance, turned right away from the road, past an elegant 17th century cottage to commence the slow ascent to the top of West Hill. It was about this time that little legs began to tire and piggybacks to the top of the hill were the order of the day. On reaching the top of the hill, we expected to see our destination, or at least some sign of it. We looked, and looked, and looked! Then, faint on the horizon we spotted the outline of a building we thought might be the inn at Devil’s Dyke. I was tempted to title this post “Getting Lost on the South Downs Way between Jack and Jill and Devil’s Dyke” for there were brief moments when we felt completely adrift among endless hills and dells. However, a little later, and a good deal more tired, than anticipated we did reach the Devil’s Dyke Inn to enjoy a much deserved dinner.